The BBC has made the first major change to its weather service ahead of a full-scale change in supplier later this year - but many users are struggling with the changes. Back in 2015, it was announced that the Met Office had lost out in the running for the new BBC Weather contract, with Meteogroup announced as the new suppliers in 2016. After a number of delays switching to Meteogroup, the new look BBC Weather website has gone live for some users, providing an early preview of the changes of graphics viewers will be able to expect across the BBC this year. 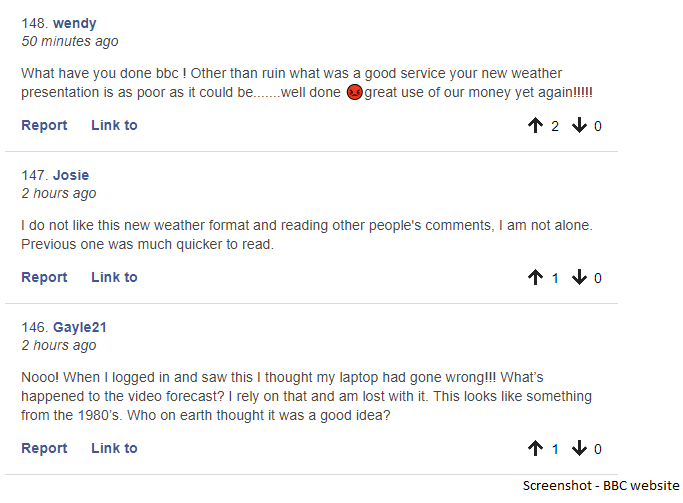 But with a different layout, and the temporary suspension of video forecasts, at least until the migration away from the Met Office is complete, users have flocked to a BBC blogpost to complain about the changes. One user said: "I absolutely HATE the new weather pages. They are virtually impossible to use. A massive step backwards. Whatever are you thinking of? Why should I have to give you a lot of personal information just to find out whether it will be raining tomorrow? I am furious at the waste of time and money spent to make the service ten times worse." As part of the BBC's drive to offer personalised services, available through the same login as other BBC services, like the BBC iPlayer, users of the BBC Weather site will need to sign in to get quicker access to relevant information for their location, which will include weather alerts in the future. And it appears that while the new website uses Meteogroup data, for the moment the BBC Weather app is still using Met Office data. An a516digital test showed minor differences for the hourly forecast at our test location, with the BBC Weather app mirroring the prediction showing on the Met Office app. In the blogpost, Michael Burnett, the BBC's Executive Product Manager for Weather explained some of the changes that have been made, including the introduction of a 14 day forecast, more locations and a new interactive map. The new look will be rolled out across BBC Weather services, including the mobile app and TV forecasts this year, coming together to provide a new unified look to BBC Weather in the first major changes to the BBC Weather map for over a decade. It was originally anticipated that Meteogroup would begin supplying the BBC with weather information last year. In October, we reported the Met Office had confirmed it was going to continue supplying the BBC with weather information for at least six months. It took the BBC nearly a month to confirm the extension and the delay in switching supplier. Meteogroup originally started off as a supplier of weather forecasts in newspapers. It already supplies weather data to Channel 4. The Met Office, meanwhile, continues to provide weather forecasts for ITV, STV, Channel 5 and Forces Network BFBS, all of which have moved to the new Met Office graphics system in the past few years.